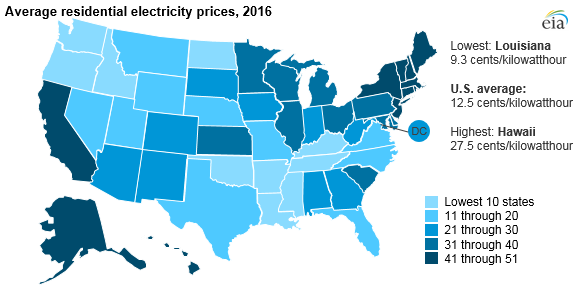 Hawaii has the highest residential electricity prices in the United States, averaging 27.5 cents per kilowatthour (kWh) in 2016—more than twice the national average. 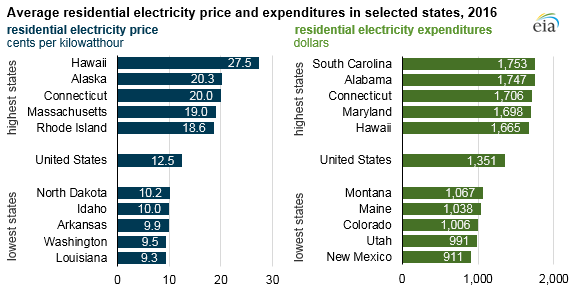 However, residential customers in four states spent more per household for electricity that year: South Carolina, Alabama, Connecticut, and Maryland. In South Carolina, the average residential electricity customer spent $1,753 for electricity in 2016, about $400 more than the U.S. average and almost twice as much as the average customer in New Mexico. Residential electricity expenditures are a function of both electricity prices and how much electricity customers use, collectively measured as retail sales. States with different prices and usage levels can end up with similar expenditures. For instance, residential customers in both Maryland and Hawaii spent about $1,700 on average for electricity in 2016, even though Hawaii’s average residential electricity price was almost double Maryland’s (14.2 cents/kWh). Residential customers in Maryland, however, used almost twice the amount of electricity as those in Hawaii, consuming 11,900 kWh per customer in 2016 versus Hawaii’s 6,100 kWh per customer. Overall, the average U.S. residential electricity customer used about 10,800 kWh in 2016. 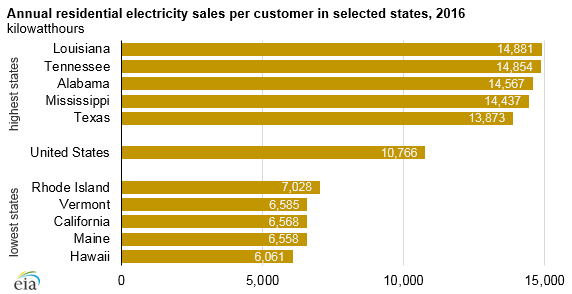 Residential customers in the southeastern part of the country use the most electricity on average. Almost all homes in the southeastern states have air-conditioning equipment and use it more intensely than other areas of the country. Homes in the southeast are also more likely to have electric space heating, water heating, and cooking than the national average. South Carolina, the state with the highest average residential electricity expenditures, had the sixth-highest average electricity usage per customer in 2016. 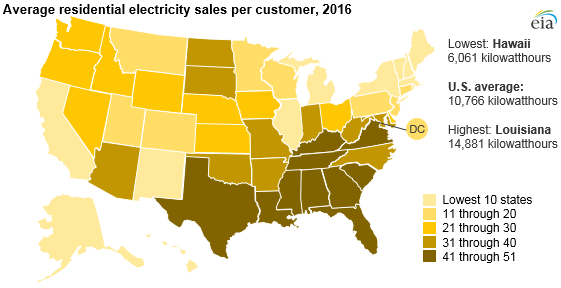 All five states with higher usage per customer than South Carolina were also in the South: Louisiana, Tennessee, Alabama, Mississippi, and Texas. States with the least residential electricity usage, such as Hawaii and California, generally have mild climates that do not require significant space heating or air conditioning. Hawaii and California in particular have also had high adoption levels of solar photovoltaic systems in the residential sector, lowering the amount of electricity sold to homes. Homes in other states with low average residential electricity consumption, such as Maine, Vermont, and Rhode Island, are more likely to have natural gas or distillate fuel oil space heating and water heating equipment, reducing the number of devices powered by electricity. EIA’s State Energy Data System compiles state-level data for several fuels; most series have values back to 1960. Consumption, prices, and expenditures of electricity in 2016 were released in late January. State-level values for nuclear energy and natural gas are expected to be available in February.